A team of researchers from Arizona State University and Vanderbilt University has found evidence that suggests the exoplanets surrounding the star Trappist-1 may be too wet to support life. In their paper published in the journal Nature Astronomy, the group describes using data from prior efforts that focused on determining the mass and diameter of the stars' planets to calculate densities, and from that, used a computer to model the likely building blocks of each. Last year, scientists discovered the Trappist-1 star system—a red dwarf 39 light years away surrounded by seven planets, all of which are similar in size to Earth. This discovery set off speculation on the possibility of one or more of the planets harboring life. The researchers with this new effort have thrown a wet blanket on such speculation by suggesting that all of the planets have too much water to support life. In modeling the planets, the researchers found that they all have far more water than Earth, from 50 percent of their mass to 10 percent. The Earth, by contrast, is just 0.2 percent water. So much water likely means there are no exposed land masses, which suggests no geochemical cycles that could promote an atmosphere. Also, a planet covered by very deep oceans would experience extreme mantle pressure preventing rock from moving upward, likely resulting in a runaway snowball effect. The seven planets are classified as rocky, which means they are not gaseous. Also, three of them reside in the "habitable zone," but their star is approximately 2,000 times dimmer than our own, which means that the planets most likely to support life reside very close to their star. But that could be a problem for a couple of reasons—one is that it means the planets are likely tidally locked, resulting in one side always being too hot while the other is too cold. Also, red dwarfs are known to flare a lot, which could spell doom for life on nearby planets. The researchers suggest their results could also have implications for theories on how planets develop as they note that all seven of the planets in the Trappist-1 system lie within the "snow line," but the model shows that the outer planets likely formed beyond that line and migrated inwards over time. Multiple planet systems provide an ideal laboratory for probing exoplanet composition, formation history and potential habitability. For the TRAPPIST-1 planets, the planetary radii are well established from transits, with reasonable mass estimates coming from transit timing variations2,3 and dynamical modelling4. 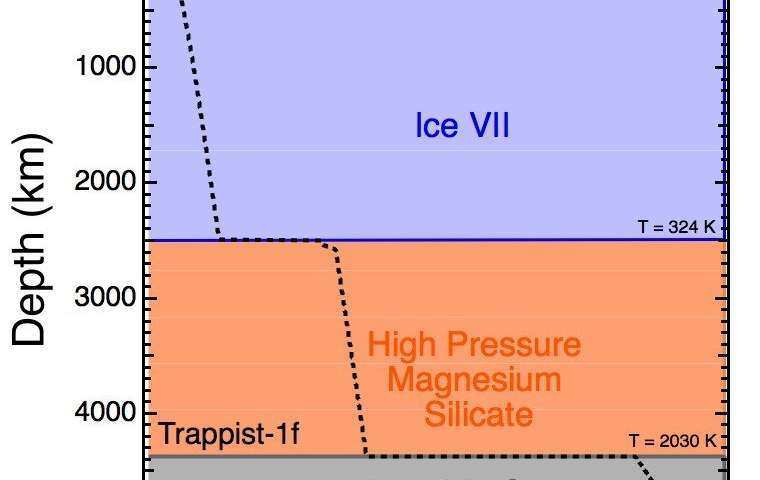 The low bulk densities of the TRAPPIST-1 planets demand substantial volatile content. 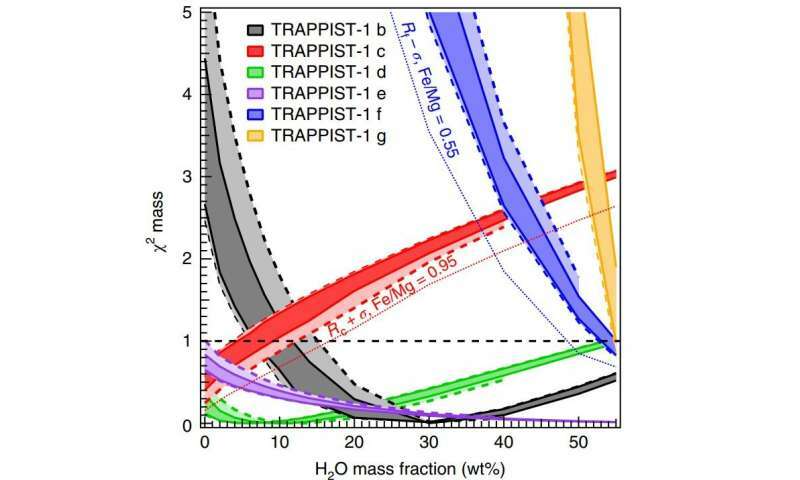 Here we show, using mass–radius–composition models, that TRAPPIST-1f and g probably contain substantial (≥50 wt%) water/ice, with TRAPPIST-1 b and c being significantly drier (≤15 wt%). We propose that this gradient of water mass fractions implies that planets f and g formed outside the primordial snow line whereas b and c formed within it. 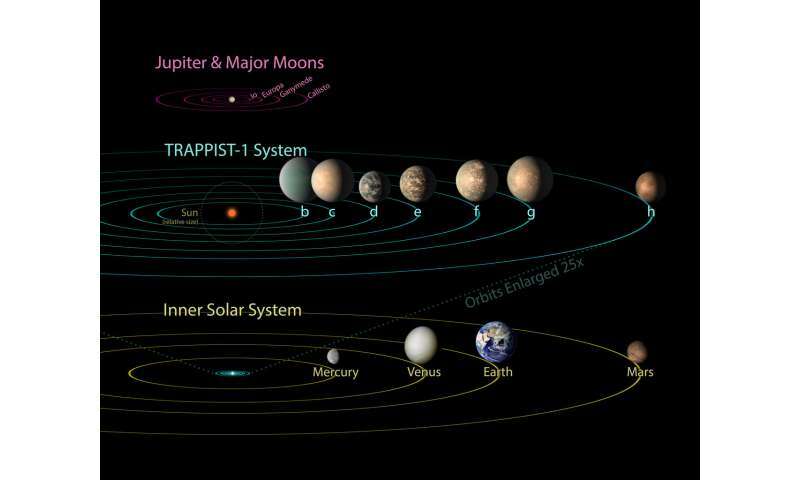 We find that, compared with planets in our Solar System that also formed within the snow line, TRAPPIST-1b and c contain hundreds more oceans of water. 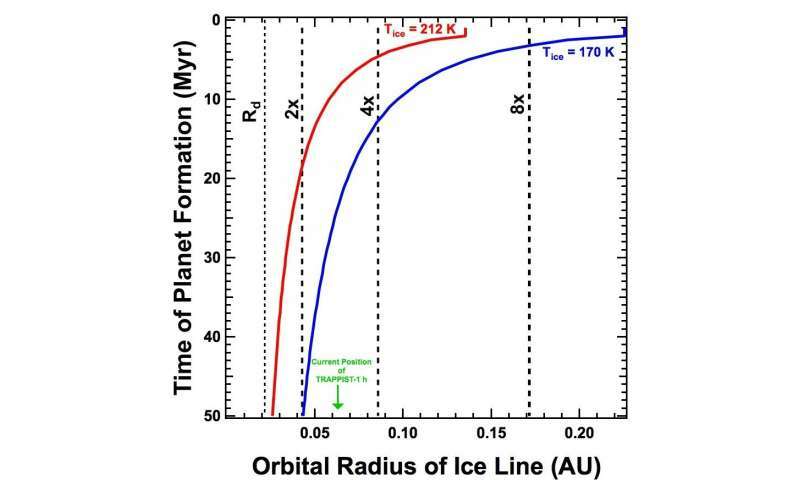 We demonstrate that the extent and timescale of migration in the TRAPPIST-1 system depends on how rapidly the planets formed and the relative location of the primordial snow line. This work provides a framework for understanding the differences between the protoplanetary disks of our Solar System versus M dwarfs. Our results provide key insights into the volatile budgets, timescales of planet formation and migration history of M dwarf systems, probably the most common type of planetary host in the Galaxy. If the conclusions hypothesized by the researchers in this article, are confirmed? One implication is that "Ocean Moons" such as Enceladus might be sterile. Mot sure if this would apply to Titan? Which would be a relief that our sloppy procedures that are suppose to prevent biological contamination of extraterrestrial environments are superfluous. Though should always be improving as 'Good Practices'. The problem remains of course, Human nature. The drive for sensationalist headlines and professional advancement and popular acclaim. Will result in fraudulent claims that contamination by Earth Life must be alien organisms. Forget about worrying how people will react upon proven discovery of alien life. Worry instead how badly the Public will react when it is revealed that their expectations of scientific progress were contaminated by fraud and error. That raises an interesting question: can a high water-content planet remain tidally locked? If one side of the planet is constantly below freezing while the other side is continually being heated, shouldn't the water slowly accumulate on the far side? Wouldn't this slow accumulation throw off the planet's center of mass sufficiently to force rotation as the body moved to re-balance relative to the star/planet system's gravitational zero point? Ocean moons can get a lot of tidal forces though, which drives geological activity. I remain more than a little skeptical about this article. AFAIK the "no landmasses" planets have been found to have no greenhouse runaway scenario when clathrate formation is included and replace geochemical cycles in scavenging CO2. Presumably then they may avoid snowballs with an analogous mechanism (release CO2 as the temperature goes down and water ice formation is promoted). Ice moons are different, both Enceladus and Europa are believed to have free rock bottoms, as well as local hydrothermal vent oases. They are going to have to have some sort of atmosphere. With that much water, they will have an atmosphere of at least a water vapor layer if they are warm enough to possibly promote life. That means there will probably also be some level of oxygen and hydrogen mixed in due to solar radiation. Maybe not a lot but there will be some.